British police restrained and arrested several protesters during the 'White Pride Worldwide Day' rally in central Manchester on Saturday, as clashes erupted between participants and rival demonstrators. The rally soon turned violent as scuffles erupted between the two groups. Footage from Ruptly shows a white pride activist chasing a black man before being punched in the head and thrown on the ground by an opposition protester. 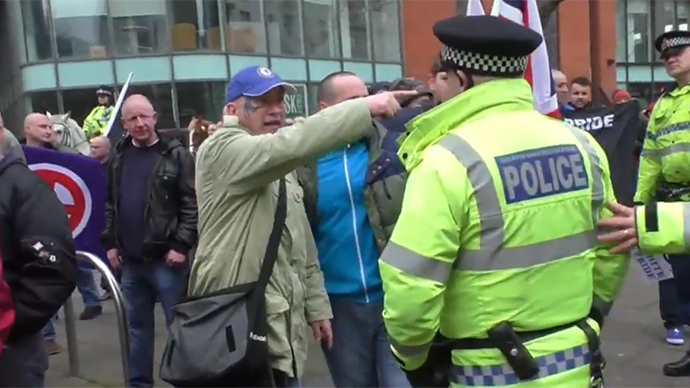 In the video, far-right supporters also swear at the press and fight with police and counter-demonstrators. Around 100 people gathered for the march, with members of the far-right National Front at the center of the event. The rally, which began at 12:30 p.m. local time, was heavily supervised by police. As violence broke out, officers intervened to disperse and separate the two opposing groups, detaining several individuals. The protesters marched from a nearby pub to Piccadilly Gardens, stressing to the press that their view is not racist. Meanwhile, the group’s opponents described the white pride participants as being drunk after gathering in a pub before the march. The Manchester City Council has spoken out, condemning the rally. “All of Manchester will condemn the vision and hatred they are bringing to our city and having read some of the scandalous antics they’ve got up to in the past their presence here makes me sick to the stomach,” city centre spokesman Pat Karney told the British newspaper.